A gloss meter measures gloss units of painted, coated and shiny surfaces typically from 20-degree, 60-degree and 85-degree reflective angles. When choosing the correct angle for gloss measurement, it is important to consider the gloss range of the surface. (See the "How to measure gloss" section below for guidelines.) A gloss meter can be used on smooth, treated or untreated surfaces such as stone, wood, laminates, floors and more. Thus, a gloss meter is a versatile measuring tool used in a variety of practical applications. Why measure gloss with a gloss meter? A glossy package adds perceived value to a product. In fact, it has been shown that the gloss level of a product has as much psychological impact on a consumer as its color. However, on food packaging, gloss does more than just maximize customer appeal. Gloss plays a vital role in ensuring consumer safety. For example, if the gloss level of an ultraviolet varnish drops during the production of food product packaging, there could be curing problems. Poorly cured inks, paints and coatings can rub, chip and flake off of the packaging to contaminate the food within. But by monitoring food packaging gloss levels during production, using a gloss meter, problems such as these can be detected early to avoid the cost of recoating or recalling. 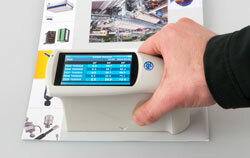 In addition to packaging, a gloss meter can be used on manufactured materials, components and the products themselves. A gloss meter or gloss tester provides manufacturing and quality control professionals with a quick and easy way to evaluate the surface characteristics of their products. A gloss tester or gloss meter is especially handy for manufacturers who produce products with a big lot size. When large lot sizes are produced, it is essential to use a gloss meter to verify that the colors and gloss are the same on every single product. This is a common expectation from customers. A number of factors can affect the gloss of a surface, such as coating amount and type, polishing smoothness, and substrate quality. By using a gloss meter and employing good quality control practices, you can ensure these variables don’t negatively impact your customers’ perception of your product. Gloss variation can be assessed quickly, easily and accurately using a professional gloss meter from PCE Instruments (PCE). Thousands of manufacturing and quality control professionals rely on PCE’s digital gloss testers to evaluate the standards and safety of their products. Each gloss meter offered by PCE is compact, user friendly and designed to take gloss measurements on the spot. This makes PCE’s gloss testers especially handy for checking gloss levels on the production floor or even in the field. A gloss meter uses a method of measurement to determine the intensity of a light reflected by a surface to be tested. The measurement values determined by this method with a gloss tester under a fixed angle of incidence act as reference values which are relative to the gloss of the surface. The measuring head of the gloss meter which is adapted to the angle of incidence (20 °, 60 °, 85 °) is placed on the material surface and the gloss value can be read out at the scale of the gloss meter. The gloss meter’s measuring head must be calibrated and a statistically sufficient quantity of data must be determined. The angle of measurement is predetermined by the gloss of the sample to be measured with the gloss meter.. The PCE-GM 60Plus gloss meter is a portable handheld 60 degree gloss meter. This coating and paint gloss meter measures the gloss units (GU) on a material's surface. The rechargeable gloss meter or gloss tester uses reflected light for gloss measurement per ISO 2813, GB/T 9754, ASTM D523 and ASTM D2457 standards. PCE-PGM 60 is a portable handheld gloss meter or gloss tester used to evaluate the shine on different material surfaces. The gloss tester includes a 3.5" TFT touchscreen display, internal memory and PC-compatible software for detailed analysis. The gloss meter PCE-RM 100 is used to measure the reflection properties of surfaces. The gloss meter PCE-RM 100 is used in furniture construction, workplace control, light planning and so on. The PCE-GM 50 is a digital gloss meter with high accuracy (±1.2 gloss points). The PCE-GM 50 gloss meter determines surface color and luster. 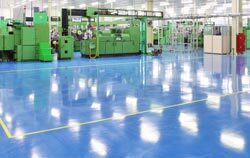 Areas of application include: building inspection, flooring, production quality control and painted, polished or varnished surface evaluation. This gloss tester comes manufacturer calibrated (ISO certification is optional). The PCE-GM 50 is a digital gloss meter with high accuracy (±1.2 gloss points). The PCE-GM 50 gloss meter determines surface color and luster. Areas of application include: building inspection, flooring, production quality control and painted, polished or varnished surface evaluation. The Gloss Meter PCE-GM 55 is a 3-angle glossmeter. The measuring angles of the gloss meter are 20°, 45° and 75°. This allows the gloss meter to be used for gloss measurements in the high gloss and medium gloss ranges. The special measuring angle of 75° allows, among other things, measurements of the degree of gloss on paper and textiles. The gloss meter is used for measuring on flat surfaces and operates on the principle of a reflectometer. The compact design and the handy size of the gloss meter makes it useful for on-site measurements or during operation of production plant. All test instruments are delivered manufacturer calibrated and can be certified to ISO as an option. The PCE-SGM 60 gloss meter with small measuring area is used on many types of surfaces to quantify their gloss units. This gloss-measuring device operates on the reflection principle by sending light from a calibrated light source onto the surface to be tested and then calculates the gloss level of the surface according to the reflection of light particles. This gloss meter allows you to measure very high gloss surfaces above 70 gloss units (GU). The gloss meter PCE-IGM 60 is an optical measuring instrument with a measuring geometry of 60°. The surface is analyzed by the gloss meter and then the result is shown. Every surface has the characteristic to reflect light. The PCE-PGM 100 gloss meter works with measuring geometries of 20°, 60° and 85°, using the reflection principle. This means that the gloss meter emits light which hits the surface to be tested. A part of the light will be absorbed by the surface and another part will be reflected. The gloss meter PCE-IGM 60 is an optical measuring instrument with a measuring geometry of 60 °. The surface is analyzed by the gloss meter and then the result is shown. Every surface has the characteristic to reflect light. A Gloss Meter with compact design and robust housing for long a testing life in various industries. These test instruments are made for a reliable and high accuracy (±0.2) gloss measurement. The data can online be transferred directly from the gloss meter to a PC via its usb interface. All gloss test instruments are sent out manufacturer calibrated and can be certified to ISO as an option. A very accurate gloss meter for industrial professionals. A Gloss Meter with compact design and robust housing for long a testing life in various industries. These test instruments are made for a reliable and high accuracy (±0.2) gloss measurement. The data can online be transferred directly from the gloss meter to a PC via its usb interface. All gloss test instruments are sent out manufacturer calibrated and can be certified to ISO as an option. A high quality gloss meter for industrial professionals. 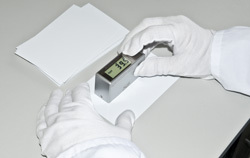 A gloss meter is a tester for determining surface gloss. Thereby, with the glossmeter, spectral reflections of a light beam that hits the surface, are measured. The touch screen allows for easy navigation. As a customer, you can call PCE Instruments' technical support hotline for assistance with finding the right gloss meter to meet your needs. Our technical support specialists will ask you specific questions about your application or your project, and then recommend a suitable gloss measuring product for your measurement task. Below you also will find some tips that you should take into consideration when selecting or buying a gloss meter. The unit of measurement used by a gloss meter is called a gloss unit (GU). PCE Instruments sells a variety of gloss measuring devices that cover the gloss measuring spectrum from matte to mirror gloss. PCE Instruments' diverse gloss meter products have different measuring ranges to accommodate gloss measurements of paints and varnishes as well as polished metals, mirrors and similarly glossy surfaces. For example, for determining the gloss of paints and varnishes, as a rule, a measuring range from 0 to 100 gloss units is sufficient. For determining the gloss of polished metals, mirrors, etc., a measuring range up to 2000 gloss units may be required. At the bottom of a gloss meter, there is a light source that, when activated, emits a light beam that strikes the surface of the test piece. The measurement geometry describes the angle at which the light beam is emitted. Due to their nature, certain kinds of surfaces require certain measuring angles to ensure accurate gloss measurement. The most common measuring geometries are 20 °, 60 ° and 85 °. Typically, the 20 ° measuring angle is used for high-gloss measurement, the 60 ° measuring angle is used for medium gloss measurement and the 85 ° measuring angle is used for matte gloss measurement (some gloss meter models offer 45 ° and 75 ° measuring angles for speciality gloss measurement). Some gloss meters are combined devices with the capability to measure gloss at multiple angles, while other gloss meters offer only one measuring angle. It is important to consider the unique requirements of your application before purchasing a gloss meter. If you plan to measure gloss on different types of surfaces, a combined gloss meter may best meet your needs. Gloss measurement is an essential practice for many quality assurance professionals. Products (and their packaging) must be consistent and must meet necessary safety requirements. PCE Instruments' gloss meters help quality control professionals comply with these internally and externally regulated standards. The product descriptions and operating instructions for PCE Instruments' gloss meters contain valuable information about which measuring instruments respectively correspond to what external standards. 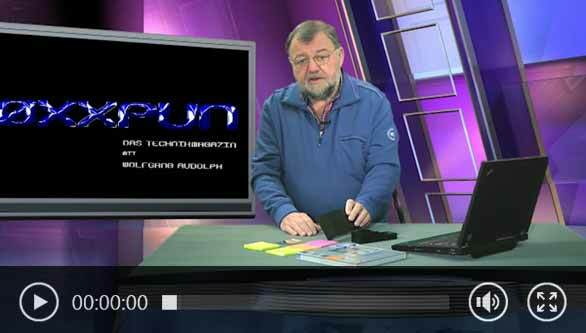 For example, DIN 67530 is a German standard for gloss measurement geometries. DIN 67530 is nominally the same as ISO 2813, ASTM D523 and BS 3900, Part 5. Until just a few years ago, it was normal for car owners to shine their cars to perfection. On some cars, an astonished observer could see his or her reflection even better than a bathroom mirror. It feels like these times are long gone. 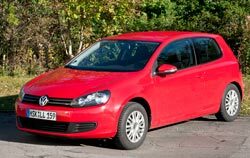 Now, more and more consumers choose matte paints and varnishes on cars. These finishes were created according to the saying, "Less is more." And yet these coatings are a sign of luxury and currently on demand in the luxury automobile market. This just goes to show how important the correct choice of color and gloss (evaluated by a color and gloss meter) is for enterprises. In physics, it is taught that the angle of incidence is equal to the angle of reflection, but this statement is overly simplified and cannot be applied in all cases. The statement that the outlet angle is equal to the angle of incidence, when the light hits a completely smooth surface, is absolutely correct. If the incident light is not influenced by any unevenness on the surface, it can also come out unhindered at an appropriate angle. However, since this is rarely the case, the visual perception of different surfaces, with regard to gloss properties, is often different. When it comes to gloss measurement by a gloss meter, surfaces can be graded as high gloss, matte and silk matte. High gloss occurs when a surface is smooth and completely polished. With high gloss, the light that hits the surface is emitted directly in the main reflection direction. In this case, the reflection angle is equal to the angle of incidence. For matte or silk matte surfaces, the light scatters in very different directions. In this way, the objects are not reflected, but are perceived by the human eye as blurred. A gloss meter generally takes the directed reflection as a basis. This directed reflection is recorded at a reflection angle by a detector, and the evaluation of this record provides conclusions on the surface nature, because the beam intensity of the light is measured. To be able to differentiate all the surfaces and to measure them correctly, there are gloss meters with different measuring ranges. In gloss measurement, these measuring ranges are called measurement geometries and are divided according to the grades of the gloss. There is a clear difference between gloss measurement and color measurement. In the case of color measurement, the focus is placed on the diffusely reflected portion of the entire surface reflection. It is important to understand that gloss measurement is concentrated on the reflections at an output angle. Although, it is a fact that the color of the specimen is partly included in the assessment of the gloss determination. However, this is the case only to a certain extent, but nevertheless, the color and brightness of the test pieces should be similar during comparative tests. Such an assessment can help, but is often not sufficient enough. Therefore, the test specimen should be measured at a 60 ° angle by a gloss meter. If at a measurement geometry of 60 °, the measurement value is more than 70, a measurement geometry of 20 ° should be used. For the case when the measured value is less than 30 when using a measurement geometry of 60 °, a measurement geometry of 85 ° must be used. To obtain usable measurement results in comparative measurements, it is essential that the measurement geometries are not changed during the comparison. Changes in the gloss meter measurement geometries can lead to incorrect measurements and measurement results that cannot accurately be compared with each other.